Motorola's back with the phone that put Android on the map. 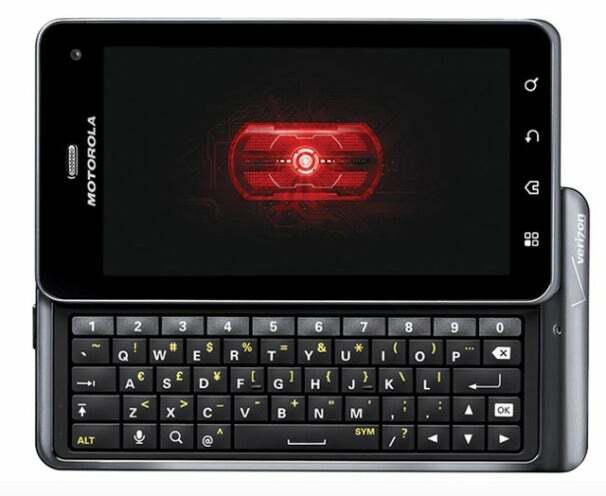 The Motorola Droid 3, a high-end smartphone with a physical keyboard, is available now from Verizon Wireless for $200. Spec boosts all around: The Droid 3 has a 1 GHz dual-core processor instead of the Droid 2's single-core offering; storage is up to 16 GB, from 8 GB; and the 8-megapixel camera records 1080p videos. The phone also runs Gingerbread, the latest version of Android for smartphones. Bigger, better display: Motorola's boosted the screen size on the latest Droid from 3.7 inches to 4 inches, and it's a qHD display with 960-by-540 resolution. That's 26 percent more pixels than the Droid 2. Number keys: Forget about typing a shift key just to enter some digits, because the Droid 3's physical keyboard has thin strip of number keys on top. Front-facing camera: At last, the Droid line gets a front-facing camera for video calls and vanity shots. No word on resolution, but don't expect spectacular images on the front side. Tiered data: As rumored, Verizon has done away with unlimited data for new contracts. The Droid 3 is the first smartphone to launch with Verizon's tiered data plans, which start at $30 per month for 2 GB. On the bright side, existing subscribers will be able to upgrade without losing their unlimited data. Lower month-to-month pricing: Most high-end smartphones cost around $600 if you forgo a two-year contract, but the Droid 3 sells for a mere $460 on a month-to-month basis. Let's hope this trend continues.